Admin wrote: what you mean James? im working on modifications as we speak! both logos, or too much? now have link to membership form on bottom of home page! I like that Brian, thanks for the suggestion and Pic. can i have a high resolution copy? so i may try it on the site template I have here? but still cant get the quicklinks that was down the side on the first new site (the black one) they just will not load! just cant figure out why! I'm afraid I have to leave that to you to sort. I am not into IT to that degree. now the cars dont merge with the logo! And if its liked by you guys, I'll use it as the club site logo! The Mods have not made comment other than they don't think it needs changing. What does Big Al think? I too want als input! Ross dose NOT like it! made that clear on facebook! as much feedback as i can get at end of day the club is all of ours! I saw that on face book. Is Ross a member? Nice to know who your friends are LOL! Come in Al what do you think? Personally, I think the logo gets a bit lost behind the cars - I liked Red Rileys original B / W one, thought the logo was still very clear. Assuming you want a contrast, and I'm not sure it's necessary, how does it look with the cars in grey and keep the logo in B/W? Sorry if that makes more work... but you did ask! also glad your here ross! just trying to keep up to date with similar clubs. after all nothing is set in stone at end of day al is in charge. ross try your idea with the white background to match the site background colour? I personally do not like the bland in-your-face white on the new darker site. I'll just go ahead and pipe in here. 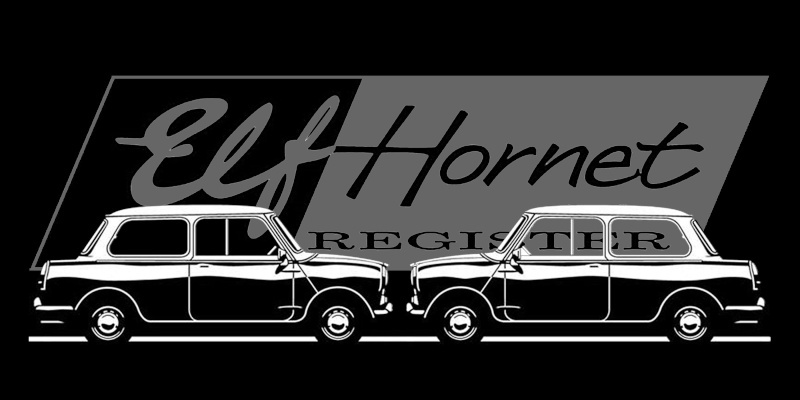 I believe that John's intention was not to change the EHF logo, which looks fine the way it is, but to incorporate some more design elements into the Register website to freshen it up and "keep up with the Joneses." This while keeping the EHF black and white parallelogram logo as it was designed and playing off the clean black/white theme with the graphic treatment of the rest of the website. So I don't quite fathom the reaction to the changes in the site to increase the graphic punch and improve the functionality. Nobody ever proposed changing the EHF logo. (Although if I had ten minutes with it in Adobe Illustrator I'd fix that wrong looking loopy part of the E in Elf. That's always bugged me a little bitty bit.) And I wouldn't mind seeing a slightly modified version of the EHF logo for the forum with the word FORUM in place of REGISTER. But the logo design is fine, and it's already well established, why f with it? Just my two pence worth. That's fine Brian.All ideas are welcome. What John and I were thinking was to bring more attention to the club and make it attractive. Obviously only people with either Marque would know what an Elf or a Hornet is, or looks like, the average person may not. We have the EHR Banner for shows and the cars are with it so thats not a problem.People will see the connection. By putting the silouettes on the Forum makes it a little more interesting, well at least I think it does. Please don't knock John, he has put a lot of effort into this, Red Riley has helped and even Steve of Autotees has helped and given his permission to use his copyright outline of the car, and all I have done is acted as a go between between myself, Steve and John. BTW We are awaiting Al's comments before anything is decided. Please keep the suggestion coming. Got a good email from Red Riley! He sorted the E and it looks better! will use your "forum" logo here on forum! It seems that the outlined cars are causing upset to peolple! I may well use one of Red Riley's images and drop the outlined cars! although, I way well use the outlined cars at the foot of the pages of the website,but slightly fade them. once again great work on adjusting the logo Red Riley! revised logo now on site an forum. red riley should get most of the credit for forum logo! Don't give more credit than I deserve. The logo was already great. I just gave it a tune-up. credit where its due m8! I'd not have a clue how to do that! and the forum logo too! but would like more info on the clipping mask thing!